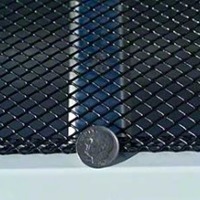 The advantages of both a gutter screen and a solid cover. Will handle the heaviest of rainfall. Keeps leaves, needles, and other small debris out of the gutter. Special coated finish has a shingle like texture and feel. Notched clip for easy overlapping installation. Fits directly to any standard 5″ or 6″ K Style gutter. Installs directly under roof edge or shingle. Available in quantities of 1200′, 60′, and 3′. Handy four foot sections fit to gutter. Made from heavy gauge steel for more rigidity. Special powder coated finish adds longer durability. Black finish blends to shingle. Also ideal for cedar shake, tile, and metal roofs. Unique edge locks directly to gutter lip. Easy installation; no special tools required. Available in 5″ or 6″ sizes. Quantities of 1200′, 100′ and 20′. Locks onto the gutter with special “locking” edge. Made of expanded galvanized steel. Special powder coated black finish adds long term durability. Each piece measure 5″ x 48″. Clips directly to gutter lip. Tipping feature for easy maintenance. Installs directly above shingle minimizing labor. Easily installation with the push of a thumb. Convexed design prevents debris accumulation. Stainless steel clip/hinge design for quick installation. Colors are Black, Brown, and Mill Finish (no paint). 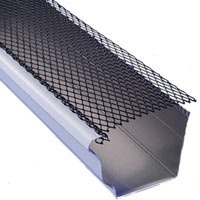 Sizes for 5″, 6″ and 7″ K Style or Half Round gutter. Available in 225′, 75′, and 3′ quantities. Drops into place quickly and easily. 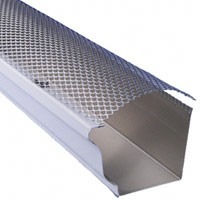 Reinforced edge adapts directly to gutter lip. Available in aluminum, copper and galvanized steel. Handy three foot sections slide under shingle. An economical alternative to roll out screens. Fits any standard K Style gutter. Available in 5″ and 6″ sizes. Quantities of 150′ and 21′. 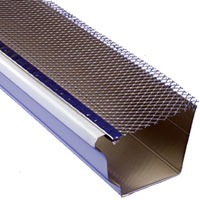 Our most economical PVC gutter guard. Made of a high quality, rigid PVC. Will not collapse under debris. Raised snap in lip prevents overflow problems. 50 guards needed for average home. Available in White, Brown or Black. 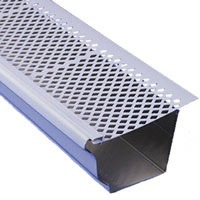 Fits any standard 5″ K Style gutter. Quantities of 540′, 150′ and 21′. Rain Chains are a beautiful and functional alternative to traditional, closed gutter downspouts. Guiding rain water visibly down chains or cups from the roof to the ground, rain chains transform a plain gutter downspout into a pleasing water feature. From the soft tinkling of individual droplets to the soothing rush of white water, they are a treat to listen to. Rick’s Rain Gutters offers a wide variety of rain chains and other gutter accessories that can emphasis your home. Rain chains make a terrific and unique gift – every home is improved by these elegant outdoor accessories, and they are easy to install! Rain chains (‘kusari doi’ in Japanese) are hung from the corners of your roof, attached to the gutter system to guide the flow of water gently to the ground; they have been used in Japan for hundreds of years. Years ago, people used rain chains to guide the water into large barrels to catch the water from the roof for household purposes and gardening. Rain chains are a beautiful alternative to traditional downspouts. They guide water visibly downward to the ground. This is known as an “open” water flow system. Rain chains also sound great! Using our gutter attachment piece, rain chains are easily installed for an efficient and beautiful water flow system. Japanese temples often incorporate quite ornate and large rain chains into their design. Link designs are the closest to the original form. They tend to splash more than cup styles, and this may be important when they are considered for areas that are near doors, windows or walkways. From plain link chain to more fancy combinations of shapes, link chains offer the most open, airy look and clean lines. They are often used with modern architectural designs, but also look appropriate in rustic settings like cabins and log homes. The Zen Loops and Double Loops chains have the strongest Asian design influence. Cup designs are an improvement over links chains in performance and efficiency. With open bottoms, they act as funnels, focusing the water from one cup down into the next one. Even in heavy rainfall, cup styles splash very little, so they can be placed anywhere. Cups come in many shapes and sizes, from the cute 2” Fluted Cups to the massive XL Scallop Cup, the largest cup style available. We also offer themed chains that include the popular Hummingbird rain chain. Our rain chains are all made of thick, pure copper (and/or brass) to the highest standard in the industry. Every chain comes with a gutter attachment piece. Our highest quality, these beautiful & functional works of art are made of our thickest copper and brass. Because of special additional special details, these chains are a little more expensive than the others. This group of pure copper rain chains are designed with natural and garden themes in mind. earth, water, air, animals, etc. Some styles may be discontinued without notice. Conductor heads enhance the beauty and architectural style on a building. They are traditionally installed under the soffit. Besides being ornamental, they also perform a number of functions. By letting air into the line, it helps water drain faster and with less noise. It also allows the combination of several downspouts into one larger one. It acts as a clean out point for debris and also acts as an overflow point for water.